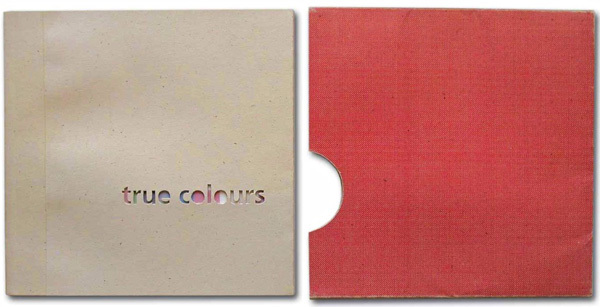 The aim of true colours was to research the written and spoken references to colours and to develop a typographic narrative which helped to understand their meaning. The outcome took the form of a square witty book, with a strong typographic background, an unusual reference for language and colour and a practical introduction to typography. The book got a commendation award by the International Society of Typographic Designers (iSTD) in 2001, when David was studying at the former London College of Printing. You can read the full book below. Once upon a time, in a small village which name I can’t remember, there was a printing press. This was a very special press where every night all the typographic characters broke the red tape and came alive, jumping off typesetting cases and metal plates. It was a wonderful type gathering. All characters are set in a baseline and all have a pre-determinated x-height. This is a formal rule in typography. Red tape refers to official formality or rigid adherence to rules and regulations. To have a red tape mind is to be rigidly bound by the rules even if they do not sensibly apply. The term relates to legal documents by lawyers and government officials, who used to tie their papers together with red tape. Originally introduced by Charles Dickens and brought into popular use by Carlyle: ‘Little other than a red tape talking machine, and unhappy bag of parliamentary’. [Latter-Day Pamphlets, 1850]. One night, in the middle of that typographic liveliness, there was a very elegant lower case vowel. The harmony of her ball serif was so stunning that the rest of the vowels used to feel green with envy and gossip about her beauty. While, on the other side of the room, laying on a dusty tray, there was a lonely and strange character, he was the black sheep of the family and nobody liked him because he was a wrong font from an old typeface. By using a transfer device the o becomes isolated, just because is a different font. The black sheep of the family is that member of a group who is thought to be a disgrace to other members of it. Normally, the black sheep is a badly behaved or disappointing individual standing out from the rest of the family. In the late 18th century, shepherds used to dislike black sheep because they were not as valuable as white ones. In times of superstition they were looked as bearing the devil’s mark. But the chief of the press, the one everybody respected most was π, he was very old and wise and had been in the press since anybody could remember. He always used his grey matter to try to solve other characters problems. Proof-marks are a clever code of communication between typographer and printer. Grey matter is a pseudo-scientific name for the brain and its mental powers. To use our grey matter is to make use of our intelligence and common sense, which is a characteristic that all human beings share. This sentence has been used over the last two centuries originated by scientists. Literally it represents the greyish tissue from the active part of the human brain, where the nerve-endings are contained. π was considered as a true blue by most of the members of the press. Everybody trusted him due to his wise experience in printing matters. Metal type is durable and consistent. Early printers used to rely on this tool to make quality prints. A true blue is a person with constant and uncompromising principles. Somebody with unimpeachable integrity and staunch fidelity. Normally used to name those people of good reputation. During the mid-late 17th century, the use of the sentence was related to people who carried blue blood. Originally attributed to the high noble Spanish families from Castille; from the fact that the veins of the pure-blooded Spanish aristocrat, whose race has suffered no Moorish admixture, were more blue than those of mixed ancestry. Suddenly, from out of the blue a voice shouted: somebody is coming! and everyone dissed quickly back to their respective cases. They knew the printer would go mad if he found them pied all around the room. To scratch a surface is a way to reveal its original material, discovering as surprise. From out of the blue is an expression used when something happens by surprise and quite unexpected. Also, when something comes from out of the blue, we mean from an unknown source at an unsuspected time. Originally used during the 20th century, it is a short version for the sentence: a bolt from the blue sky. In this phrase the inclusion of the bolt, as an element that comes out unexpectedly from the sky, helps us to understand much better the visual meaning. Fortunately, it was just a red herring from little asterisk, he was always joking and misleading with his great sense of humour. The asterisk is an element to mislead or distract the attention towards a footnote. A red herring is a phrase used to express when an action is introduced in order to deliberately mislead. Also, it is used to deflect the attention from the truth. The sentence was introduced during the 1880’s in fox hunting terminology. A red herring had a very strong aroma and therefore was used to mislead hunting dogs by dragging it across the fox’s trial. Little asterisk was a funny guy, like a red rag to a bull, always causing more excitement than trouble. Bulls are colour blind, but they react towards the movement of the rag [tracing paper]. Like a red rag to a bull is used when something is calculated to excite range and deliberately provoke an immediate reaction. The phrase comes from the bullfight in Spain. When a Torero waves his red rag towards a bull, he is intending to provoke a reaction of anger in the bull. But the bull can not really see the cape because it is colour blind, so it reacts to the movement of waving the red rag. After the little white lie from tiny asterisk, all characters came down to decide about their duties for the following morning . . .
By changing the e for the d in the typecase we are creating a little lie. The tape corrector emphasizes the mistake. A white lie is a harmless lie, and it is merely more convenient or polite than telling the truth. The origin is unknown, however historical research illustrates that white denotes purity, simplicity, innocence, truth and hope. It could also be related to religion [perhaps, because a white lie is not a sin].
. . . but as usual, the heavy 8 could not be bothered to come down to the baseline. Then π said: stop being a white elephant and come down here immediately. Letterpress equipment is expensive and spacious to keep. A white elephant is something too costly to be worth maintaining. Normally it is a useless item or person. Sometimes we can find white elephant stalls in second hand markets. Albino elephants were regarded as holy in ancient times in Thailand and other Asian countries. To keep a white elephant was a very expensive task, since you had to provide the elephant with special food, and provide access for people who wanted to come and worship it. If a Thai king became dissatisfied with a sub-king, he would give him a white elephant. The gift would, in most cases, ruin the recipient. π spoke again: right, tomorrow is going to be a hard day, if we want to hit the white, we have to work together in accordance to give a good impression to the printer. To print correctly, it is indispensable to register the type or film on to the press, especially with more than one colour. To hit the white is to be quite right or to make a good shot. Basically it can be used every time we accomplish a established task or target. The phrase was used in the old days when archery was a common practice. To hit the inmost disc or centre of the target is to hit the white. Another name for the centre of the target is the bull’s eye. Therefore to score a bull or to make a bull’s eye means the same. π was in charge, he mentioned that to avoid purple patches, they all should work as a group in order to pursuit legibility. Typographic ornaments become tools against legibility. A purple patch is an extremely or over ornamented portion in a literary work. The function of this adornment is to embellish the piece of work, however sometimes this may cause problems with visual legibility or distraction if there are any main communicative intentions from the work. In the 18th century the style rococo was characterized for its elaborate ornamentation, which applied to music, architecture, painting, music, etc. Unexpectedly, everything went bright and the printer realised he had had a dream. He must have fallen asleep on the composing room and been dreaming all night long about typographical characters. asterisk is a star shaped symbol [*] quite often used as a footnote or reference mark. baseline is the imaginary line where all typographic characters are aligned evenly on top of it. Some characters [g, y, p, q, j] have got descenders hanging from it. bold is a heavy weight version of a typeface. composing room is the place where type is make up into lines and pages by the compositor and printed in a letterpress. diss is a short expression for distribute and means returning letterpress type to the case after printing. em is the width of the body of the upper case ‘m’ in any typeface. It is also the standard unit of measurement [pica]. en is half the width of an em. It is assumed to be the width of an average character, and so is used as the basic unit for calculating the number of pages that a given amount of copy will make when set in a given typeface and size to a given area. impression is the pressure of plates in contact with the paper at the moment of printing. italic is originally cursive handwriting from Italian manuscripts of the 14th and 15th centuries. Nowadays means almost any inclined character. legibility is the ease with which the individual characters of a particular typeface can be identified. The top and right halves of letters are more recognisable than the opposite halves. ligature is when two or more letters joined together in one body producing a more aesthetic shape [ffi, ffl, fi, fl, ff]. metal plate is a one piece printing surface, distinct from assembled type. ornament is a decorative motif that normally illustrates flowers and leaves. Used to make frames and other decorations around the page. pica is the English unit of typographic measurement equal to 12 points or 4.21mm. pie is jumbled metal type in piles. Sometimes spelt pi. point is the main system of typographic measurement, 1pt = 0.351mm. quad is a letterpress spacing material used to fill out lines of type. registration marks are the marks in the same relative position on films or plates to enable correct positioning to be achieved. serif is the formal way to end a stroke in hand-drawn letters. That extra amount of ink eventually developed into the serif for printing typefaces. thick is a fixed space equal to one third of an em. thin is a fixed space equal to one fifth of an em. letter has its own pocket to allow quick recognition from the compositor. typeface is a specific term to denominate a style of type [e.g. Frutiger]. woodtype are typographical characters, usually in sizes over 72pt, made from wood. Often called woodblocks or poster type.